Kenyan security forces in Nairobi was still busy evacuating people from an upmarket hotel complex in the capital several hours after suspected Islamist extremists launched an attack killing at least 11 people. Responsibility for the assault, described by police as a “suspected terror attack,” has been claimed by Somali Islamist militant group Al-Shabaab. Tuesday’s coordinated assault by armed gunmen on the Dusit D2 compound, an upmarket cluster of shops and hotel facilities, represents the most high-profile terror attack in the East African country in several years. Authorities reported that “scores” of Kenyans and foreign nationals had been evacuated from the compound, and that the site had been secured, but sporadic gunfire continued to be heard hours after the all-clear had been given. 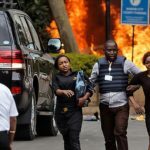 The attack began at a bank inside the compound on Tuesday afternoon, with an explosion targeting three vehicles in the parking lot, followed by a suicide blast in the Dusit Hotel foyer, where guests sustained severe injuries, Joseph Boinnet, inspector general of Kenya’s national police service, told reporters. Heavy gunfire and an explosion sent people running for their lives. Footage from the scene showed armed officers escorting office workers and injured people to safety as the sound of shots rang out. Cars in the compound could be seen aflame as a helicopter flew overhead. 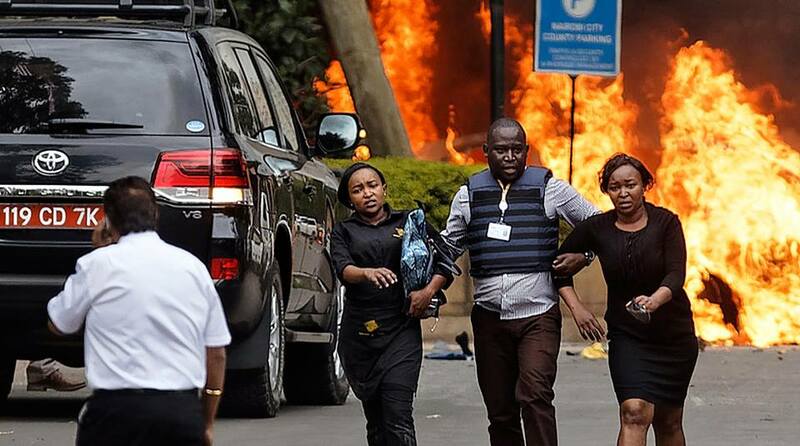 Kenyan anti-terror units, other law enforcement agencies and ambulances rushed to the scene on Riverside Drive in Nairobi’s Westlands affluent neighborhood as people with bloodied clothes could be seen fleeing the complex. Nearby, students from the University of Nairobi’s Chiromo campus were evacuated onto the street. UN Secretary-General António Guterres condemned the attack and expressed “his solidarity with the people and government of Kenya,” according to a statement.